Light reflecting off churches and palaces, views of craggy mountains and blue sea, smells of orange blossom, oregano and mint … Sicily is an inspiring place, particularly for northern Europeans. “To have seen Italy without having seen Sicily is not to have seen Italy at all,” said German writer Goethe in 1787. Thriving Siracusa, inhabited since ancient times, is at its liveliest at market time (Mon-Sat 7am-1pm). 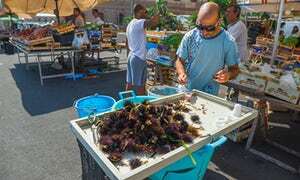 Sellers on Via Trento and side streets around deal in delicious things: men at an upturned crate prepare spiky sea urchins with their bare hands, a fishmonger pares steaks off tuna, and stallholders preside over mounds of melon-sized aubergines. Street snacks include €2 cones of freshly fried whitebait, and oysters with a glass of fizz (€5). The market is on Ortigia island, Siracusa’s oldest district, where sights include the ruins of the sixth-century BC temple of Apollo, medieval palaces and the cathedral (a recycled 2,500-year-old Greek temple). San Filippo in the former Jewish quarter offers free tours of its crypt and three levels of Greek-built tunnels plus a medieval mikvah, or Jewish ritual bath. 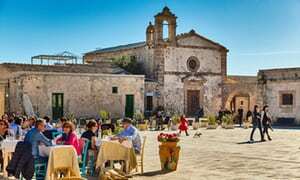 The look of much of south-east Sicily is a result of a huge earthquake in 1693. Afterwards, architects were given free rein to design palaces and churches in their own curvaceous take on baroque. 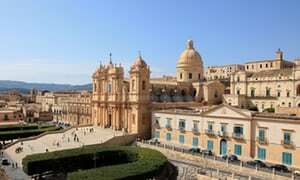 Noto was rebuilt on a new site, streets aligned to catch the sunlight, which bathes buildings in an apricot glow. Corso Vittorio Emanuele feels like a vast work of art, or a film set. 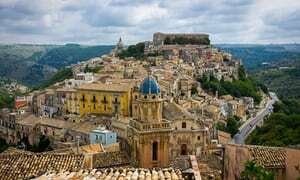 Other baroque glories in Unesco-listed Noto valley include Ispica, rebuilt on its hilltop site; Scicli, in a narrow gorge; and Modica, known for dark, gritty chocolate. Probably the most beguiling is Ragusa, its “new” (18th-century) town on one side of a gorge and old Ragusa Ibla, rebuilt on site by stubborn traditionalists, on the other. Here, wedding-cakey Duomo di San Giorgio gleams behind intricate iron railings, and down the square, Gelati Divini does suitably heavenly ice-creams, including cherry tomato and olive oil flavours, perfect for eating in the 19th-century Ibleo garden, with palm avenues and valley views. The new town is the place to head after doing the sights: it’s livelier and cheaper, a grid of sloping streets and extensive views. Piazzas San Giovanni and Matteotti are buzzing on summer evenings, with restaurants, gelaterias and cultural events, including a literature festival in June. Inland, the Cassibile has carved out Sicily’s “grand canyon”: the Cavagrande. Pack walking boots and water, then follow road signs from Avola and keep driving up, and up. Parking (€3) is by a bar on the lip of the canyon and the 45-minute walk to the bottom makes the clear pools, waterfalls and smooth rocks for lounging even more inviting. The gate has been officially locked for some time, but everyone ducks through a gap in the fence – very Sicilian. The walk back up is a lung stretcher. South again, Vendicari nature reserve (free, parking €1) is a peaceful oasis with 15km of paths among reed beds and beaches, hides for watching wading birds, and old tuna fishery buildings that look like Greek ruins. (A tuna museum is open, mornings only.) A cafe by the car park serves snacks and drinks beneath trees, and LùBar, a little way down the path, does a sophisticated aperitivo with sundried cherry tomatoes, nuts and olives. 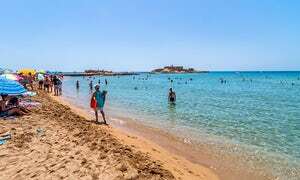 True sophisticates flock to Marzamemi, a fishing village long known for good seafood that has now been thoroughly discovered, its ancient core home to shoals of restaurants, bars, boutiques and even a “concept store”. Ordinary homes in streets north of the centre house residents probably bemused by the designer shades and mankles, and there’s a grocery here for normal-priced picnic supplies. A perfect antidote is unpretentious Portopalo di Capo Passero, the most southerly town in Italy, with its castle, lighthouse and small beach. Bigger beaches and the most southerly point of Italy, Isola delle Correnti, are a short drive away. Here you can eat fat grilled prawns (€8) at Lo Scialai beach bar, while reflecting that you’re actually further south than Tunis and parts of Algeria. Pedestrianised Via Cavour in Ortigia is lined with restaurants. Try Kalliope (Via Consiglio Reginale) for pizza and fish – tuna with mint is a standout – or Le Comari (Piazza San Giuseppe) for exquisite vegetarian food. South on the coast road, the village of Ognina is said to be where Ulysses moored his 12 ships before his encounter with the Cyclops. 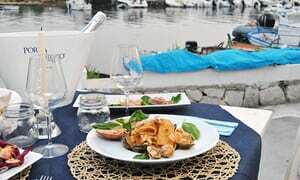 There’s not a lot to do there today except relax with drinks at Sunset Bar, then enjoy mussels and clams on a tomato base (€14), or 48-hour sourdough pizza, from €6, next door at Almyra, watching fishing boats head to sea as darkness falls. In Portopalo, trattoria Sapori di Puglia, (Via Vittorio Emmanuele 49) does Puglian specialities, such as orecchiette with greens, and fish mains (swordfish with cherry tomatoes €13). Afterwards, grab an ice-cream or granita from tiny K2 at number 82, before strolling down to the seafront at Piazzetta dei due Mari. Restaurant Vecchia Ragusa (Via Rapisardi 87), in “new” Ragusa, does delightfully chewy pastas (ravioli with broad bean purée, or tagliatelle with walnuts and caciocavallo cheese), plus meat dishes such as veal with mushrooms, olives, capers and tomatoes. Dinner for two with wine is about €40. There’s so much to see and do around Siracusa that it’s worth settling into a villa for a few days, which can be very affordable outside of August. 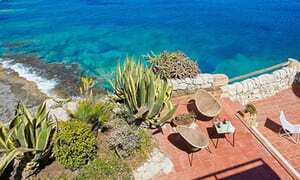 Wish Sicily’s Villa lo Scoglio near Fontane Bianche (sleeps six from €160 a night) has extensive gardens and terraces, and direct access to rocks for swimming. In Portopalo, new B&B Casa dei Carrubi has seven rooms (doubles from €50 B&B, including a family room by the swimming pool). Breakfast is basic (coffee, fruit and pastries) but it’s great value and two rooms have little roof terraces with 270-degree sea views. In shoulder season, though, it is possible to enjoy high style in Sicily for only a little more. 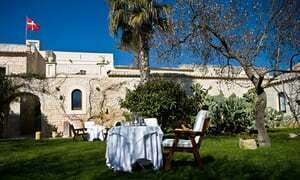 Five-star Eremo della Giubiliana, near Modica and handy for Comiso airport, is a restored 12th-century monastery, with a pool in a walled garden and fine dining in its candlelit courtyard, yet deals on smaller doubles (former monks’ cells with en suites) can be under €100 a night. 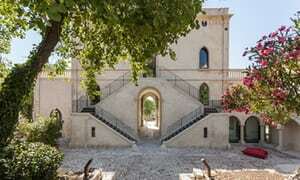 On the edge of Ragusa, Villa Boscarino (from €90 B&B) looks equally medieval but was built in 1895 by a society doctor to escape the cholera in town. Rooms with shady terraces are in sleek, modern wings sympathetic to the creamy stone of the old house, and there’s a garden with a folly and grotto. Breakfast is in the family chapel – cheese and salamis laid out where the altar once was. 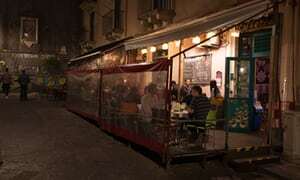 Catania is hard to love at first sight: noisy, trafficky, and built of dark volcanic stone. But in time, the charms of this studenty city emerge. Its Palazzo della Cultura on Via Vittorio Emanuele II has an excellent Escher exhibition until 17 September – and it stays open until midnight on Saturdays. On the backstreets, there’s a row of coffin showrooms in Via Castello Ursino, and a 200-year-old candle workshop (Gambino, 4 Via Porticello). 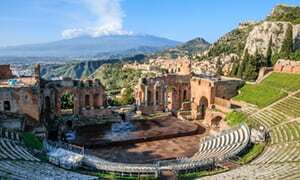 Sicily’s manmade wonders pale beside Europe’s highest active volcano. Organised tours from Catania are pricey; it’s much cheaper to visit independently. 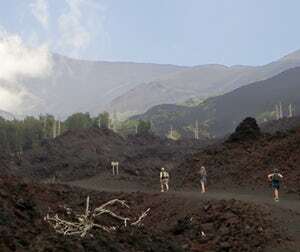 Etna Sud is the nearest gateway, served by AST bus to 2,000m Rifugio Sapienza (€7 return). An option from here is a cable car over the black-brown, lunar landscape to 2,590 metres (€30 return), then a 4WD ride (extra €40), or arduous two-hour hike, to within 100 metres of the summit. 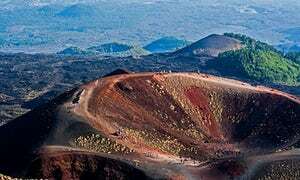 Etna has been quite active this year, so be prepared to change plans: the national park is huge and if some areas are out of bounds, others will have opened up. The landscape is extraordinary, and the views amazing. Those with a car can avoid commercialised Etna Sud by heading above the town of Linguaglossa, through forests of sweet chestnut and pine, to Etna Nord, with just a handful of gift shops and cafes, and 4WD buses up to the craters (check they are running – concession wrangles each year can mean delays or interruptions). Recent activity means the highest slopes and craters can only be visited with a guide (try Lara Mansfeld,+39 368 663453, etnatrekking.com) but trekking among the lower lava flows, spotting skeletal burned trees and the protruding roof of a buried hotel, makes a low-cost, unforgettable day. Don’t miss Dario Lo Scavo’s shop/gallery near the Nord car park for astonishing images of recent eruptions – he also does guided photography walks. There are more volcanic marvels near Francavilla di Sicilia where, thousands of years ago, red-hot lava met the ice-cold water of the Alcantara river, forming a series of gole (gorges) with rippled walls like organ pipes. Parts are open only to those who pay €13 to take a lift past a tacky dinosaur museum, but up the road is a €1.50 “public” entrance. Take the 200 steps down gorge walls dripping with oleanders and prickly pears to huge smooth rocks that look like Henry Moore sculptures. Bring swimwear and sturdy sandals and wade upriver for a picnic, or join Truvatura (€60pp) for an exciting two-hour canyoning excursion. Catania’s at its most fun near the university, in Via Crociferi and narrow Via Penninello, where the Internetteria serves craft beers and affordable cocktails to Catania’s tattooed, pierced and bearded residents. Find more counterculture at communist-themed Nievski (Scalinata Alessi 17) with plastic funnels and colanders for lampshades and leftist icons from Zapata to Che and Uncle Ho on the walls. It gets lively after 9pm and food is organic and mostly vegetarian. Serving great-value meals to farmers in Francavilla di Sicilia since 1947, Trattoria Rapisardi (Via Roma 63) looks like a pine-clad greasy spoon – but the food belies this image. 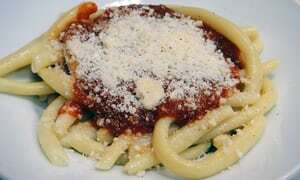 Homemade six-inch-long macaroni in tomato sauce is Italian food at its simplest and best. With a mixed antipasto, steak or massive pork chop, salad and local wine, the bill for two was under €30. 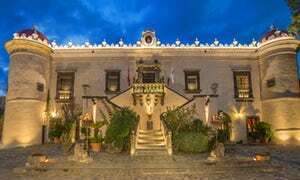 Half an hour from Catania airport, with views of port and beaches, B&B Aloisio (doubles from €70 B&B) is the converted top floor of architect Sebastiano’s family home in a leafy suburb. Breakfast is particularly good, with homemade bread, fruit, cakes and jams sweetened with honey. Hotel d’Orange in Francavilla has a rooftop pool, in-house pizzeria and doubles from €39 B&B. 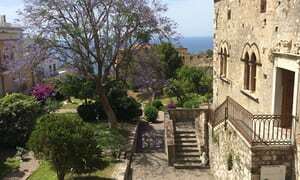 Or combine Etna with a beach stay at Castello San Marco (doubles from €126 B&B, castellosanmarco.it), built in 1689. Rooms are in bungalows in the grounds, and there’s a pool, a private beach and a restaurant that does the seasonal organic thing to great effect. Tortuga Beach Club next door has weekend DJs from 10pm. Taormina’s about looking, rather than doing – views, fashionable people, pretty streets. It’s pricey, but it’s worth staying a night to enjoy it after the coach parties have left, and to have the Greek theatre (€10pp) almost to yourself early next day. It costs nothing to gaze out to sea from Piazza IX Aprile, or from the gardens endowed by a mistress of Edward VII, then climb steps off Via Circonvallazione towards Madonna della Rocca chapel to enjoy free views of the amphitheatre. There’s free sunbathing down below on the sands near Isola Bella. The piratical history of this area is written in its hilltop villages – coastal settlements were too vulnerable. One of the best is Savoca, atop several crags. 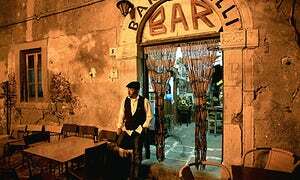 Most of the Sicilian scenes in The Godfather were filmed here: Bar Vitelli is still in operation, and there’s a Coppola memorial in the square. 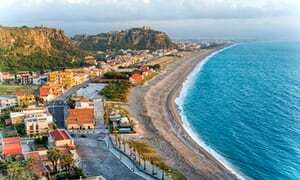 Milazzo, round the corner on Sicily’s north coast, is for most a jumping-off point for the Aeolian islands. But past the huge oil refinery is a welcoming port with a ninth-century castle, and beyond that an 8km peninsula of pretty shuttered houses and silvery-sand beaches (Punta Mazza and Punta Cirucco are the best). At its tip is a geological marvel: from where the road ends near a cluster of restaurants, walk for 20 minutes through olive groves to Venus’s Pool, an almost circular natural pool of clear, sun-warmed water, swimmable even in winter. 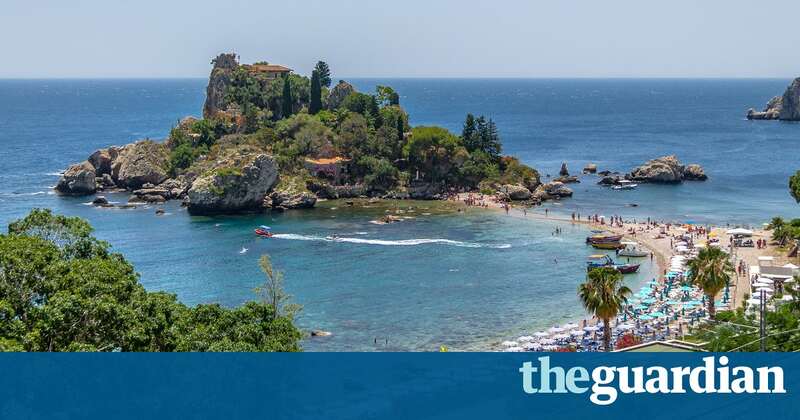 In Taormina, restaurants with a view charge matching prices. Spend the money on food instead at Rosso Peperoncino, in an alley behind the cathedral, serving ravioli with ricotta, almonds and pistachio (€9), or orange salad with leeks. 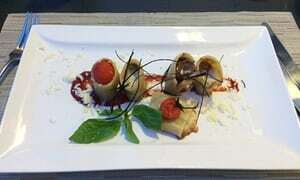 In Savoca, Francesco Tosto is chef at Borgo San Rocco (see below): his paccheri pasta filled with aubergine and tomatoes were memorable, as was tuna in pistachio crust, and rabbit stew with Modica chocolate (four courses with wine about €45). 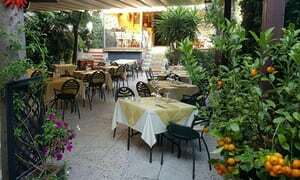 In Milazzo, La Casalinga (Via d’Amico 13) is a homely trattoria known for fishy specialities. Go early to bag an outside table and enjoy mixed grilled fish or pasta with rocket and prawns (mains from €10). Hotels in Taormina can cost thousands, but there are great views and reasonable prices at Hotel del Corso (doubles from €65 B&B), run by the friendly Turriano family, with a roof terrace for breakfast. 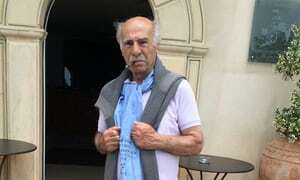 The delight of a stay in Savoca’s albergo diffuso, Borgo San Rocco (doubles from €105 B&B, online deals available) is cigar-chomping owner Vittorio, an Einstein lookalike who welcomes new arrivals on the terrace with a glass of superb wine. Bedrooms are in village houses – all with great views of hills and sea – and there’s a panoramic pool down yet more steps. 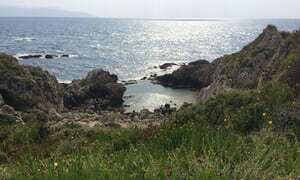 Lido Ponente is a 5km west-facing shingle beach north of Milazzo. Half-way along, 10-year-old Esperia (doubles from £75 B&B) is a design hotel with decor in beaten metal and poured ceramic by local artists. There’s eclectic modern art on the doors of the 10 bedrooms, and four self-catering apartments through the garden behind.